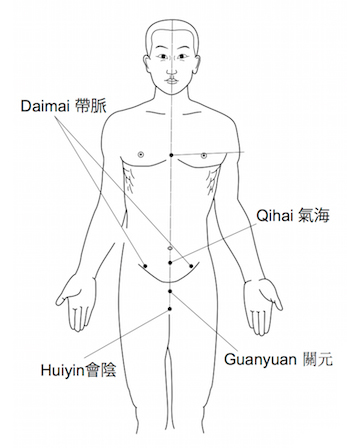 The Guan Yuan關元 point is one of the most important points that relate to the Dantian 丹田. It is like the basement of the Dantian. If the basement of a building has a problem, then the entire building has a problem. If we can clear any problems with the foundations, then everything can be alright. Sometime we can look at a plant and it looks as if it is dying, but eventually it is alright. This is because its roots are healthy. Sometimes it is the other way round, we see a plant that looks healthy and then eventually it dies. Again this is because of its roots, as the roots are its foundation. Chinese philosophy places a great emphasis on foundation, then the internal aspects and then the heart. 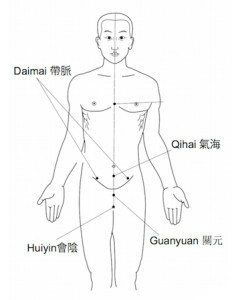 The Guan Yuan point is 3 Cun寸(pronounce Charm it means inch) below the navel. “Guan關” means “Gate” and “Yuan元” means “Original”, together “Guan Yuan “means “Original Gate”. This means that the “Original Qi 元氣” is stored here. When it is strong, the area around the Guan Yuan is firm and a little bouncy, but when it is weak it is too soft. When we are young the Jing精(sexual energy) is strong and as we get older the Jing gets weaker, to the point where some older people do not even think about it. In this case the Guan Yuan point is weak because they have no reaction of that. Also they will go to the toilet a lot more, but there is not so much urine. This is all due to the condition of the Guan Yuan point weaks. Practising Qigong teaches us to save our Qi, then the Guan Yuan point will be strong and so our bodies will remain younger. This is why Daoism always advises us to control our Jing.